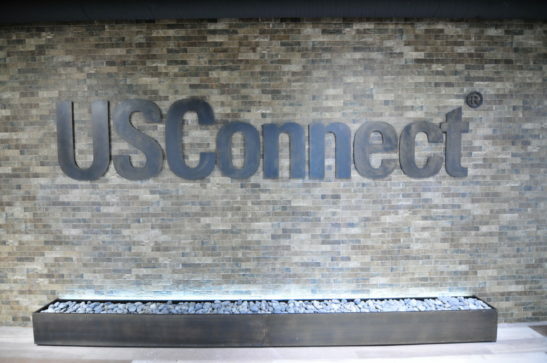 USConnect is America’s only nationwide wireless integrated food service network. USConnect provides only the highest quality fresh food through customized dining services and corporate catering, smart vending machines, unattended micro markets, and office coffee services. Comprised of the industry’s leading independent food service firms, USConnect provides its clients with the very latest in employee food service options and its proprietary loyalty and promotional program—all while serving the freshest, healthiest foods designed to meet your company’s demanding food service needs. 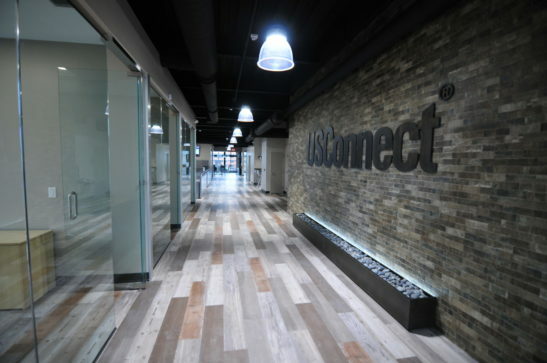 Working in tandem with Design Solutionz, Inc. to help complete the up-fit of USConnect’s new office space in downtown Greensboro, North Carolina, Holt Environments conceptualized and engineered this laser-cut, patinated steel plate logo. Weld nuts attached on the back surface of each letter capture threaded studs that were individually drilled and inserted into the recently cladded tile wall. A custom fabricated, patinated, steel-wrapped planter with integrated LED uplighting was also installed to wash the tile wall and steel logo with white light. You can visit here to learn more about our signage and wayfinding capabilities.